There is a reason why the Maoist movement flourished in Nepal, a country steeped in chaos, conflict and cold war. No doubt, the Maoists took advantage of political instability and politicians’ fight for the chair and corruption. 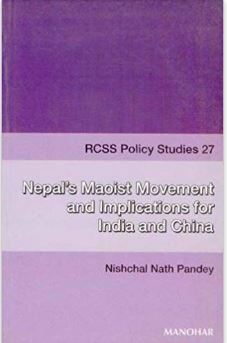 But take “Nepal’s Maoist movement and Implication for India and China,” written by Nishchal Nath Pandey, scholar and well-known analyst on international affairs, regional cooperation and internal security of Nepal. The book takes the reader through the labyrinthine history of Nepal’s communist movement, start of the Maoist’s war, basic causes behind the growth of the insurgency, implications of 11 September developments, the appalling saga of human rights violations, the cat and mouse game of talks and its political implications for the neighboring India and China. To be specific, the book delves deep into the Maoist movement and how it all started. Abject poverty and ailing economy was the first and foremost factor in furthering the Maoist rebellion that had actually conceptualized as far back as 1974. The book examines the facts as to how human rights violations have occurred from both the governments and the Maoists’ sides. The book traces the crisis from political instability to an unfair societal system affecting all levels of the kingdom’s polity. The book is one of its kind as it also highlights the implications for India and China of a sustained political instability and festering insurgency inside this crucial buffer zone that is of geostrategic importance to both the Asian giants. What makes Pandey’s book particularly relevant for the contemporary reader is his unbiased detailing of causes and consequences of the Maoist movement.